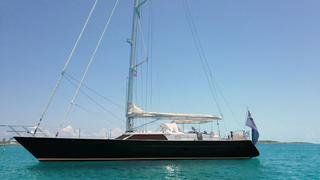 The 24 metre sailing yacht Limitless, listed for sale by Jim Acher at bluewater in Palma, has been sold. Built in GRP by Sensation Yachts, Limitless was delivered in 2009 as a high volume sloop and has been well maintained since, including a 2016 paint job on her hull. Limitless offers a light interior with dark wood and cream furnishings creating a luxurious and elegant feel. An expansive main saloon and state-of-the-art galley make this the ideal platform for both family and charter use. Her interior has been designed to comfortably accommodate six guests in three cabins. She features a full-beam master cabin aft and two generous double guest cabins, all with full en-suite facilities. Her owner's accommodation is particularly impressive and features a separate shower room with Carrara marble. She can also accommodate one member of crew to enhance the time on board. She offers a lovely space for al fresco dining on deck — the perfect place to relax after a day's sailing. Limitless also benefits from having a 4.7 metre tender with a 70hp outboard motor recessed on the foredeck. Under power a 300hp Caterpillar diesel engine gives her a comfortable cruising speed of 12 knots.